The sculptures by Adrienne Jalbert awake the imaginary interior voyage. 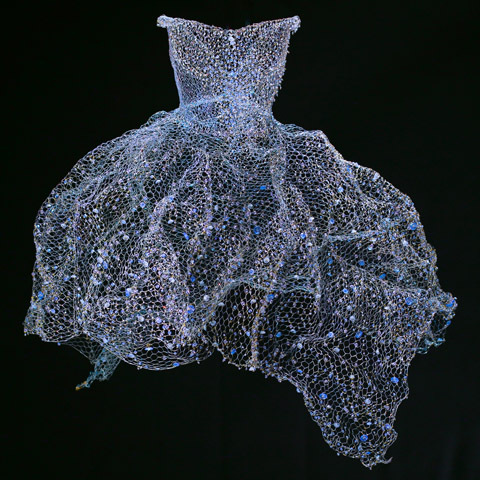 Her spheres extend the artistic vision of nature and her gowns of light, like hopeful commets, suspending the gaze, hypnotizing it through a precious artistic glimmer. Adrienne Jalbert hands an enchanting and seductive representation of this assorted material. In the beginning, there were stars. In this cosmic atmosphere of simulated solar energy, Adrienne Jalbert’s sculptured balls invite to brush shoulders with the stars. 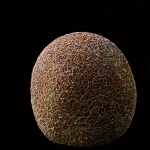 Brass, bronze, enamelled brass, worked into successive layers, founded upon a vegetal material, visually close to wood. 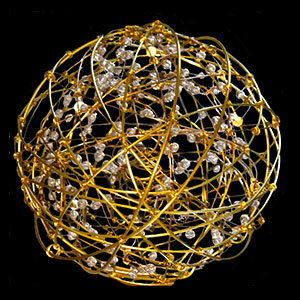 Like meteors fallen from the sky, these intricately sculpted spheres edged with light, reminiscent of a daydream. 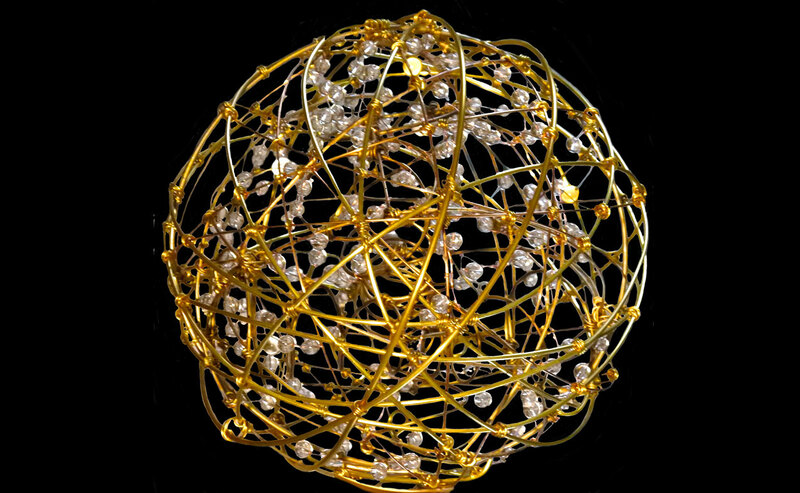 Even installed on the ground, these true telluric energy collectors pervade through the artist to the material, these spheres of interwoven, tangled threads, wound up in a ball, slowly penetrate our indoor garden that is flooded with beams of light, subtle echoes of the artist’s dresses of lights. 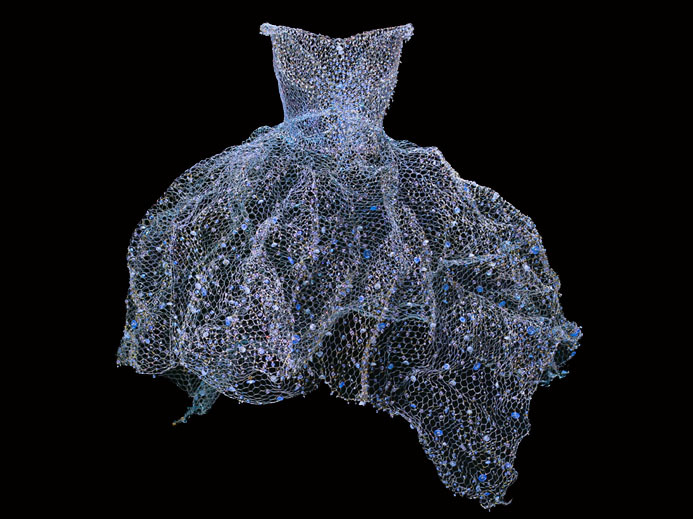 Adrienne Jalbert’s sculpted gowns are simply the divine sensation of an ethereal femininity, precious and delicates in its marked size and its pearled skirt floating in an imaginary wind. 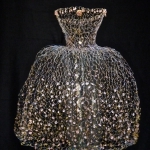 Adrienne Jalbert sculpts space, the impalpable, the creation of precious stones and glass buttons. Gliding invisible females wear her crafted designs. Moving in step with the music, these ballerinas in light pink, flow through the air, sparkling with a million lights as if propelled by the force of these worked materials: brass, bronze, crystal and gold. Her metallic knitted dresses are a direct appeal to daydream. 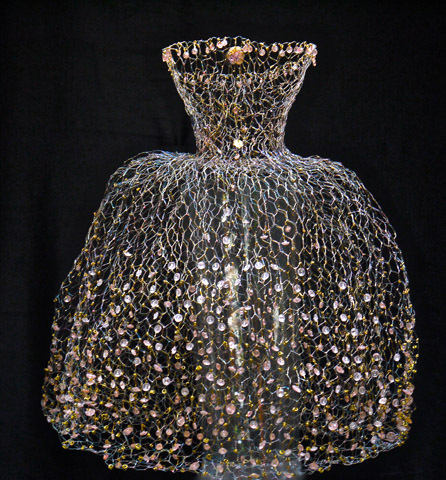 Like curtains of light, studded with drops of delicately posed water, each of these creations is an expression of her contained artistic force, showing only the fluidity of their shaped silhouettes. These elegant slender mysteries lead us through a fantastical poetic dance, guiding us towards the limbo of the unfathomable future of our very being. 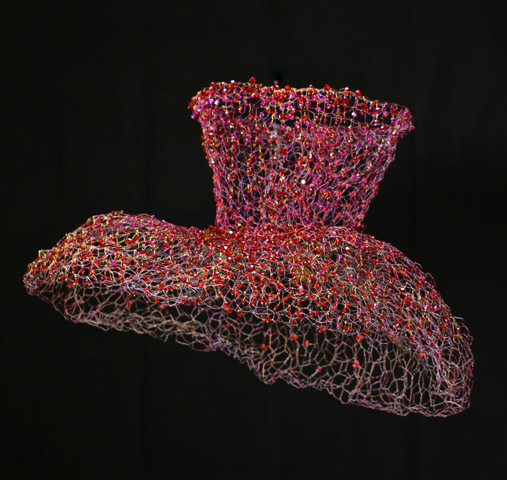 Adrienne Jalbert spins metallic threads like a modern-day Penelope. With expert strength, dexterity and patience, Adrienne breathes artistic waves into her work that extract us from our daily lives and transport us to a hemstitched, crystalline fantasy world. 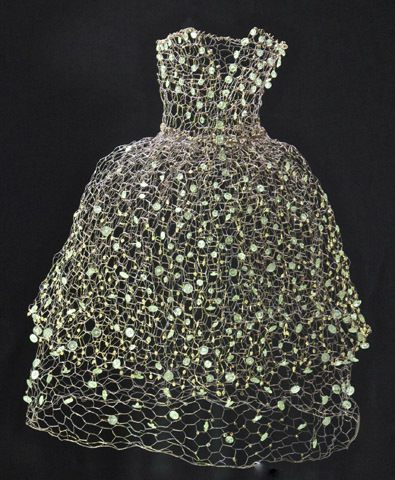 Adrienne weaves volume into her sculptures, as if to capture the air that surrounds us in the framework of her string, and catch this impalpable material in her web, the material of life. Adrienne Jalbert is a Franco-American artist, visual artist and sculptor that has lived in Paris for thirty years. Laureate of the Académie des Beaux-Arts, Adrienne Jalbert’s work is represented in numerous museums and particular international collections. Museum of Fine Arts, Malta – Alcatel-Lucent World Headquarters, Paris – Sun Electronics Corporation, Nagoya – Taisan Industrial Co., Tokyo – Kenwood – Coll.Goodwin, London – Hotel Hokkaïdo – EDA, European Design Alliance -Coll.Ph.Luyt, France – R.N.B. Place Vendôme, Paris – UNY Co, Ltd – Coll.Nomura, Tokyo – Coll.Chiba, Tokyo – Fujita Group, Hakone – BMC, France – Italian Graffiti – Coll.Huhn – National Museum of Archeology, Malta – NHK, Tokyo – Coll.Kirmser, Bouffémont – France 2 – National Academy of Art, New Delhi – Ministry of Culture,Jaïpur – ISO, Brasilia – ParisNetWork – A.R.T.E.Charpentier, Paris – C. La Prod, Paris – Coll.Gicquel, Cannes – Philippe Deshoulières Porcelaine de Limoges – Coll.Bernard-Dunckel, NY – Alcatel, Velizy – Coll.Richard, Paris – Fondation Nationale des Arts Graphiques et Plastiques – Coll.Casablancas, Paris – Coll. Fonda, Jakarta – Coll.Larock, Paris – Coll.Renard, Marseille – PT Holding,Plc, Plovdiv. 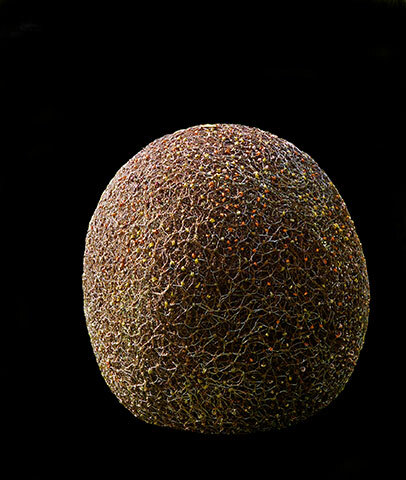 Galerie ACABAS, Paris 3e – a permanent exhibition of Adrienne Jalbert work finishes October 2014. 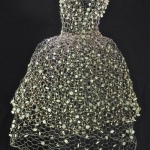 Exhibition of sculpted dresses – Espace Cardin.